How much data do people actually use? Obviously, we're all holding on to our unlimited data for dear life, but I'm curious how much data do people use a month? And, for the heavy users, what eats the most of it? I don't have unlimited - 4GB plan. I am usually under 2GB - sometimes I go over. 4 smartphones, of them 3 are iPhones 1 is Android. I am the only one that really uses data. 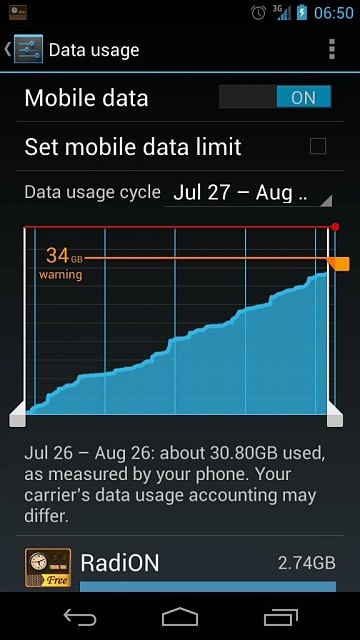 I use a 2-3GB a month, maybe but I never truly needed unlimited so I didn't miss it. I know there are users who burn 30-50GB a month and I just don't see how. 5-8 GB a month for me mostly Google play all access streaming music while I'm working out and/or driving. I have unlimited so why waste space on my phone pinning music when I can stream? tippmann15 and mysticmeg like this. I seriously don't get how some people use 50-100 gb a month. I use about 3 gb. Somebody either has way too much time on their hands or no wi-fi. I use about 500mb a month. Had unlimited with my Thunderbolt 1.5 years ago & calculated that I would use 1.5gb max with my SGS3. 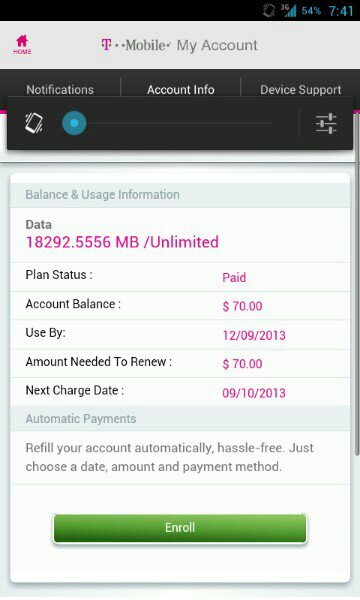 So far my busiest month was 700mb. I am not a heavy user & look at most videos on my computer where I should. Live in the sticks. I have no cable so Netflix and prime it is. Have unlimited data and going to use it until the promo is up. At 2.5-3.5 gigs a hour it's not that hard. tippmann15 and bigdaddytee like this. The future of our daily living is lte/5g. Televisions, computers, dare I say gaming platforms. The price of data is going to have to change at some point. I'm on average 20gb a month. Stream music allot on highest quality and do allot of video calling. Seem futuristic walking down the street. Oh yeah, I'm holding on to my Verizon grandfathered unlimited data as long as possible. Love the peace of mind of never having to worry about data usage regardless of what I'm doing with the phone. 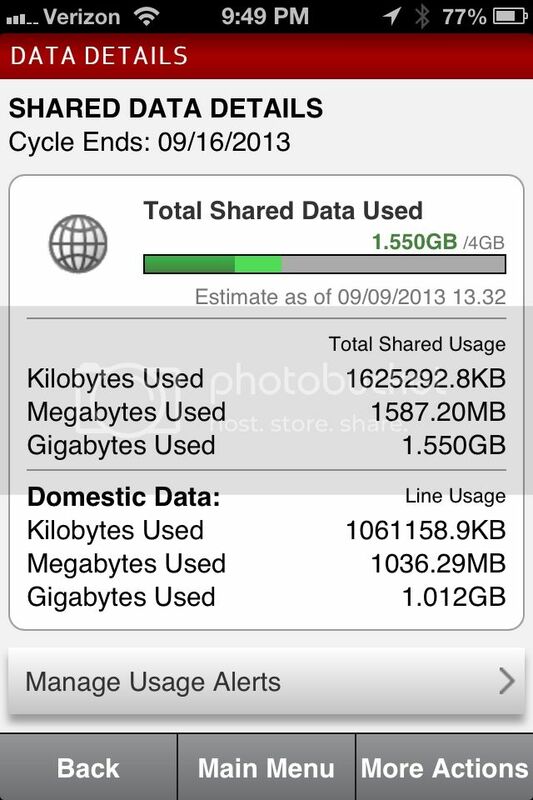 Most months I average around 2 GB, sometimes a little more. But during the NFL football season it can jump to as high as 20GB depending on how many games watched (via Sunday Ticket on the phone itself or on a tablet tethered to the phone via FoxFi). I also recently started tethering my tablet and laptop to the phone more often for the fast LTE speeds as our home DSL blows (in particular the upload speed!). So I expect my average usage to increase. 8-10GB per month average, but can get as high as 30GB when I am really busy. I barely come close to 2GB, but I like having unlimited because I can tether when there is no wifi available, especially going to visit relatives in the south. Those of us with unlimited are like gun owners who fear giving up our arms to the government. karsdroid, cjsmoove and nrokdrums like this. In my area LTE is strong and fast so I use that more then WiFi. I have unlimited data and hit around 5-10gb a month. Also this was my first LTE phone (note 2) so I loved the fast streaming of everything on my phone. Verizon unlimited. I use about 30 gb a month. How? I drive truck, three to five weeks at a time. I won't pay the outrageous truckstop wifi prices, and since I team drive, when I'm off duty the truck is moving and out of range anyway. What? Streaming video, podcasts and internet radio get most of it, then social media and internet browsing. Why? Because Verizon and I made a deal, and I pay my $30 every month. karsdroid and Central n ohios best like this. How do you make Gmail app the default mail app? Can I use iPad Mini and Nexus 7 on same Chromecast?